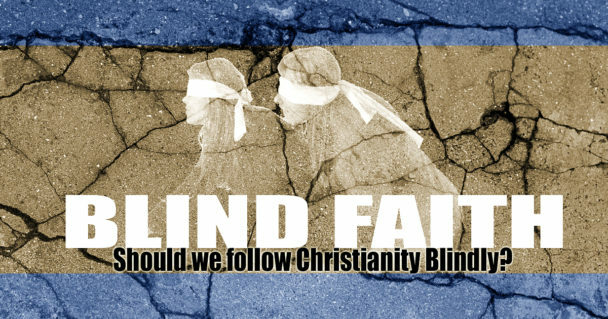 Should we follow Christianity blindly? [audio:http://www.truthrevolution.tv/show/TS-0328.mp3]No Flash Support? Use this Audio Player! Dave: Some atheists say that Christians are expected to have blind faith to believe in Jesus. Jeff: But that runs counter to what the Bible actually teaches. Dave: That’s right! Proverbs 3:13 says ‘blessed is the one who finds wisdom, and the one who gets understanding’! Dave: Yes! And the proof of Jesus is not in just a couple scriptures, there’s also prophecy, testimony and other texts outside of the Bible. Jeff: If we were to take just one piece of evidence and base our faith on that, then you could call it blind. And we would agree! Dave: Exactly. But the mountain of evidence for our faith is overwhelming and convincing. Jeff: So much so, that it has become impossible to ignore! For more information, check out the Cumulative Case for Christianity!